As the eighties were ending, Metallica raged about the nature of freedom in their song «Eye of the Beholder». A role-playing video game (RPG) with the same name came out a few years later. Even though the two had little in common, role-playing games and metal went hand in hand in those days. As such, the title may have lured quite a few role-playing metal-heads to try the game out. 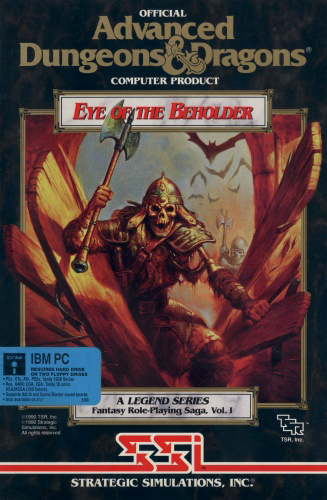 The game «Eye of the beholder» from 1990 is a grid based RPG with a first person perspective. It is not the first game in this genre. That honor belongs to «Dungeon Master» from 1987, which in many ways was a much more revolutionary game. 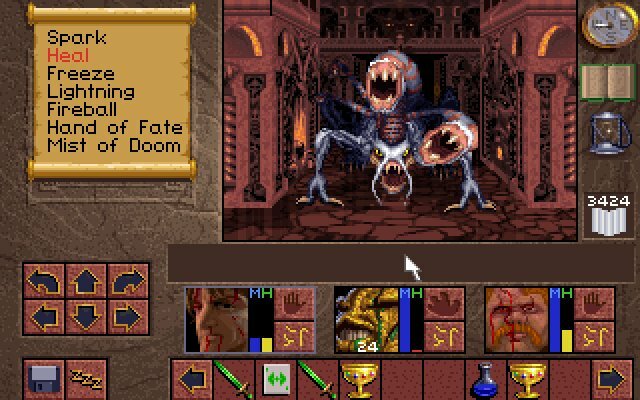 «Eye of the Beholder» is however the game most people think about when they reminisce about old first person RPGs on computers. Likely because it was totally awesomez. The game is based on the rule system from the tabletop role-playing game «Advanced Dungeons & Dragons», which the year before had been released in a new, polished and user friendly second edition. It also had respectable pedigree. Westwood, the developers, might have yet to make a proper name for themselves, but the publisher was Strategic Simulations Inc (SSI), whom were established heroes of the computer RPG scene due to their «Gold Box» series of games. This series, which started with «Pool of Radiance», was also based on «Advanced Dungeons & Dragons». Additionally, «Eye of the Beholder» had really good graphics for its time. At the end of the eighties, the Amiga was the king of home computer graphics. As the nineties were dawning however, IBM based PCs were starting to gain ground due to VGA graphic adapters, which could show a palette of 256 simultaneous colors on screen. «Eye of the Beholder» used this capability quite well. The game plays out underneath the city of Waterdeep in the «Forgotten Realms» universe. This is the same universe as in subsequent well known RPG classics like «Baldur's Gate» and «Icewind Dale». You control an ensemble of adventurers hired by the masked and mystical Lords of Waterdeep to investigate a potential threat to the city in the catacombs below. As your party enters the sewers, which incidentally has very pleasantly colored stone walls and does not look particularly dirty, the entrance collapses and the only way out is onward. One moves around the catacombs much in the same way as in a modern first person shooter (FPS), except your steps are rather big and you can only turn in four directions. You see the world in front of you through a relatively small view-port on the screen. This view is interactive and allows you to manipulate visible objects like doors and objects on the ground with the mouse. The rest of the screen is filled with things like compass, event log and portraits of your party. Much of the fun came from exploration, which often was a co-operative activity. The game had no auto-map functionality, so you had to make your own maps on paper. It was quite beneficial to play the game with a friend, so that one might watch for enemies and fight them, while the other navigated the maze and drew the map. An additional brain was also quite handy when puzzle solving was required. You also had to keep the party nourished and occasionally find a safe place to camp, so that mages and clerics could memorize new spells. 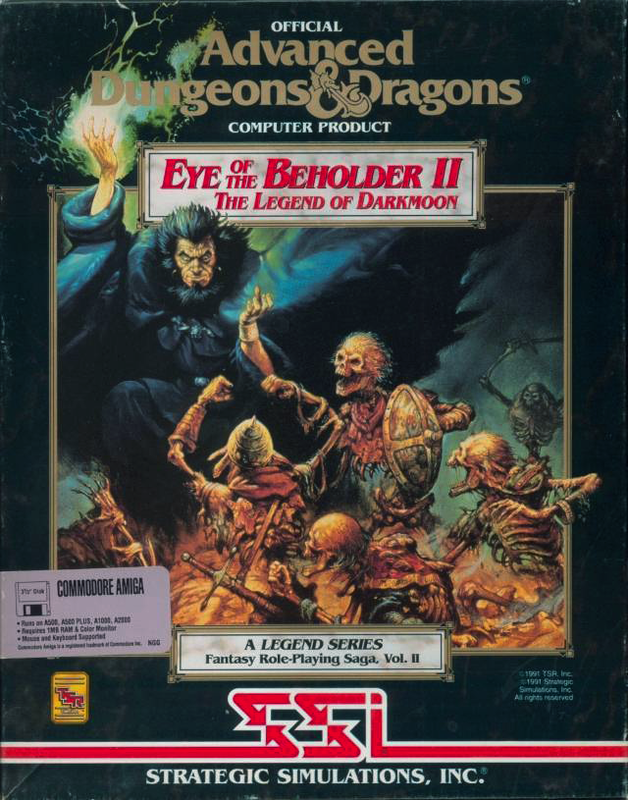 In 1991 the second chapter of the saga was released: «Eye of the Beholder II: The Legend of Darkmoon». It added new stuff like outdoor areas, more interaction with other characters and a generally higher quality of graphics and production value. You could also import a save-game from the original, and thus continue the saga with the same characters and equipment. As the third sequel was being planned, artistic differences between Westwood and SSI started to mount regarding the future direction of the franchise. This eventually led to the end of their partnership. In 1992, Westwood was acquired by Virgin Interactive, and they started work on a new series of games in the same genre as «Eye of the Beholder». As a result, both Westwood and SSI released first person RPGs in 1993. From SSI came the official third chapter of the saga: «Eye of the Beholder III: Assault on Myth Drannor». It was based on the same engine as its two predecessors, but the game design was this time done in-house by SSI themselves. They apparently didn't know quite what they were doing. The game was badly received by fans. Maps were considered sub-par, battles too easy and the story lacking. There were also performance issues, likely as a result of changes to the user interface. As a result many fans of the originals needed more powerful hardware to run the final chapter. Later that year a game came out that would completely change everyone's expectations regarding first person perspective in games. In December 1993, «Doom» from Id Software struck the gaming world like a fist. It provided graphics and interactivity that until then had been only a dream. Practically over night, nobody wanted to produce or publish anything but «Doom»-clones. Westwood would eventually become known as innovators within another genre of games entirely. The year they ended their partnership with SSI they also released «Dune II», by many considered to be the first entry in the genre today known as realtime strategy (RTS). In 1995 they knocked it out of the park with «Command & Conquer». The «Eye of the Beholder»-series was quite popular among the tabletop role-playing crowd. Many would convert characters from their own «Advanced Dungeons & Dragons» campaigns and use them in the game. Others (like myself) would eventually come to cultivate a passion for tabletop role-playing because of «Eye of the Beholder». 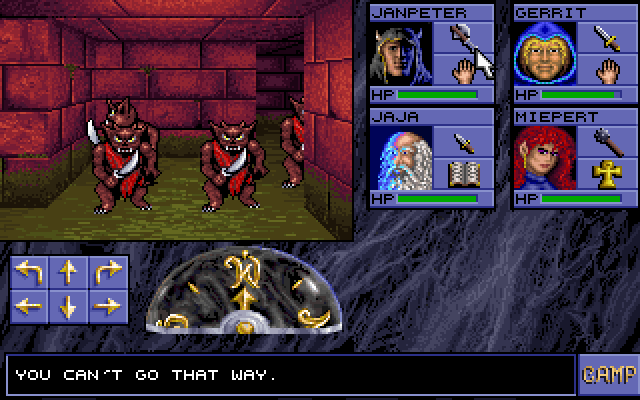 The first two chapters of the saga were ported to the Amiga about a year after their PC releases. The Amiga version had better music and sound, and the slightly disappointing ending of the first one, which only consisted of some text, was replaced by a more engaging animation. The Amiga version did however have a reduced color palette compared to the sparkly VGA-splendor of the PC version. There exists a mod for the Amiga version, which enables the graphical resources from the PC version to be used with the Amiga code if you have a newer Amiga model with an AGA chip-set (or an Amiga emulator for PC). In this way, it's possible to combine the best aspects of both versions into one package. Last year, the grid based RPG genre was awoken from its slumber by Finnish indie developers Almost Human with their excellent «Legend of Grimrock». It combines modern full-screen 3D graphics with the grid based mechanics of the «Eye of the Beholder» series. After many years of more or less realistic FPS games where one can move freely, it is a little surprising that a game which only allows you to move in four directions works as well as it does. Likely, it works because the simplified navigation makes it possible to control several characters as efficiently as one in a modern FPS.